Home » Everyday » People Think Brown Rice Is Better Than White Because They Don’t Know This! People Think Brown Rice Is Better Than White Because They Don’t Know This! Rice – the seed of a grass species called Oryza Sativa or Oryza Glaberrima, is a staple food in most of the world, particularly in Asia. 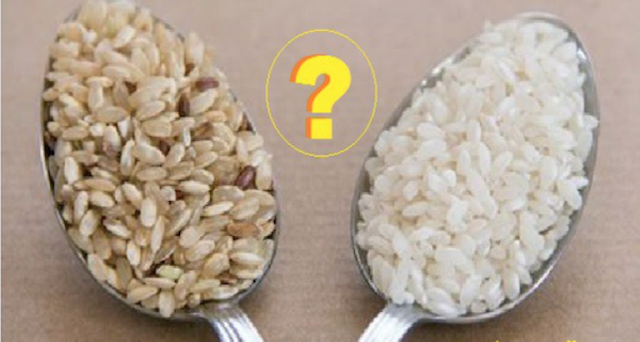 There are two variants of this cereal grain – white and brown rice. While the white variant is typically identified as unhealthy food (this also goes for white sugar and white flour), the brown one is considered healthier (including brown sugar and flour). This may be true of sugar and flour, but, rice is an exception to this rule. In order to break down the common misconception about rice, we’re going to present several facts about the two rice variants. The first misconception about white rice is that it increases blood sugar levels. This is due to the fact that other white carb foods including white bread have a high glycemic index. When it comes to rice, the type of rice rather than its color determine its glycemic index. For instance, basmati rice has a very low glycemic index no matter whether it’s brown or white. In fact, according to a study published in the International Journal of Food Sciences and Nutrition, brown basmati rice increases blood glucose levels more than white basmati rice. The study included 14 healthy participants, who were given 11 different types of rice including white and brown basmati rice. Each participant’s blood glucose levels were then measured in order to determine the glycemic index of that particular type of rice. What the researchers found was that white basmati rice had low glycemic index, meaning it didn’t increase blood glucose levels, whereas brown basmati rice had medium-high glycemic index, meaning it raised blood glucose levels. The study concluded that rice color alone isn’t a parameter for the glycemic index of this grain. Although brown rice is generally considered healthy, there are several reasons why you should stick to white rice. For one thing, white rice tastes much better than brown rice. Plus, unlike white rice, brown rice packs more phytates, also known as phytic acid. Phytates are often referred to as an “anti-nutrient” because they prevent the absorption of a number of healthy minerals found in rice including iron, zinc and calcium. Although one-time consumption of high-phytate foods including brown rice is not a health threat, regular consumption can result in a mineral deficiency, which in turn triggers other health complications. All things considered, both white and brown rice come with benefits and shortcomings.